For the last five years or so, Mystic Seaport has been the temporary home for one of the most amazing murals ever painted. When Benjamin Russell and Caleb Purrington finished their masterpiece in the late 1840’s, the result, known as the Grand Panorama of a Whaling Voyage ‘Round the World, was celebrated as a realistic depiction of the whaleman’s life in pursuit of the leviathan. 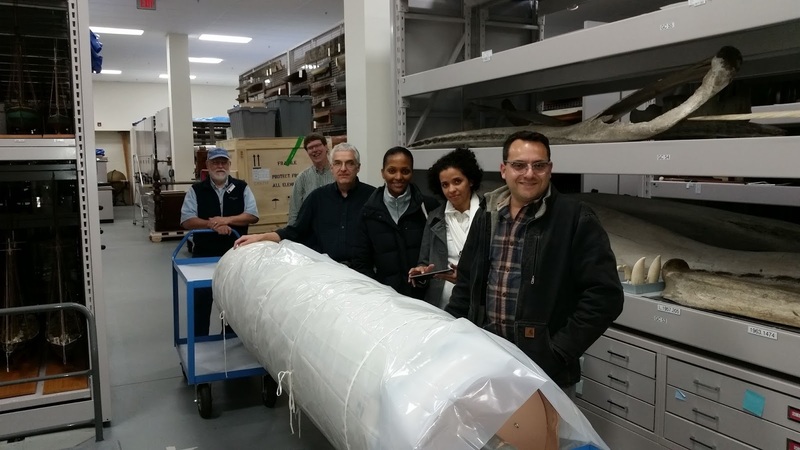 Just recently, Mystic Seaport staff members assisted New Bedford staff in removing the second of seven rolls from our Collections Research Center for its trip back to New Bedford where it will undergo long-anticipated conservation work. 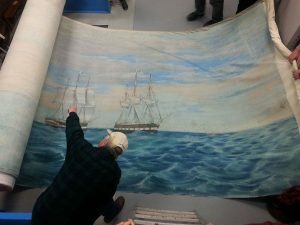 The first roll was retrieved last year and the first phase of its conservation is nearing an end in public view at New Bedford under the watchful eye of the half-scale whaling bark LAGODA. This oversized painting stands nearly eight and one half feet tall and if opened up to its full length it would stretch for approximately a quarter of a mile. It may very well be the longest painting in the world. When it was completed it was displayed in New Bedford and then went on a tour throughout the United States. Each roll stood vertically on a spindle on a stage with a take-up reel positioned some feet away. As the panels stretched and rolled between the two spindles, a narrator would describe to the seated viewers just what it was they were observing as they vicariously traveled around the world on a whaleship. You can learn more about the panorama and view a video production about it at the following link: Panorama History. Mystic Seaport is happy to have been of service to our fellow maritime museum while they endeavored to raise funds for the conservation work. Mystic Seaport and New Bedford personnel, along with visitors from the Cape Verde Islands, readying a section of the panorama for travel. New Bedford Whaling Museum Historian Mike Dyer examining the first roll in the Collections Research Center.